I recently traveled to Japan with a few friends and absolutely loved my experience there. Japan is the perfect combination of culture, history, architecture, food, and city life. Even with a full week in the country, I feel like I didn’t get enough of Japan. The Japanese are also some of the most polite and courteous people ever. Even though there was a slight language barrier, everyone we met went out of their way to help us and took immense pride in showing us their country! To maximize your time there, I’m sharing my top 10 Japan travel experiences – things you absolutely must do there. A more detailed travel itinerary is at the end of this list. Kyoto was once the capital of Japan and is home to many Buddhist temples, Shinto shrines, and palaces. In the afternoon, you can visit the Kinkaku-ji temple, which is another Zen Buddhist Temple and a UNESCO World Heritage Site. This was one of the most serene sights in Kyoto: a three-storied golden pavilion sits in the middle of a pond – an experience you absolutely can’t miss on your Japan travel itinerary. In the evening, you can visit the Kodaiji temple. We walked there through the Gion district, which is a famous spot for sighting geishas as well. The Kodaiji temple was beautifully lit at night, had a short lights show, and is home to a small bamboo forest as well (which was also lit up at night). Fushimi Inari is a collection of shrines located on the side of a mountain. The main shrine is at the bottom, and smaller shrines are interspersed between more than 1,000 Torii gates (the orange and black gates you have likely seen in pictures). Leave enough time to explore this in peace – we had one hour which was definitely not enough. There is no entrance fee to this monument. There are loads of tourists here all the time, but the higher you walk, the quieter it becomes. On the walk to/from the gates, there are small shops serving some local delicacies. The Arashiyama Bamboo Forest is a ~40 minute drive from the center of Kyoto and a Japan travel experience you cannot miss! You park in the small town next to the forest, and walk along a river to the top and into the forest. There is no fee to visit this and walking through the actual stretch of forest will likely only take you 20-30 minutes. Walk at your own pace because it is a very small forest. Note that to avoid the many tourists, you will have to go early in the morning. This is also a great time to get some fantastic photographs! The Hiroshima Peace Memorial is an extremely somber location, but worth including on your Japan travel itinerary. It is commonly known as the A-Bomb Dome and is a designated UNESCO World Heritage Site. This building was the only structure left standing near the bomb’s hypocenter, after the U.S. dropped the first atomic bomb on Hiroshima in 1945 in the final stages of World War II. The Hiroshima Peace Memorial Museum, which documents the history of Hiroshima before the bombing, the decision and reasoning for choosing Hiroshima for the bomb, and the lives of the citizens after the bombing, is also located near the dome. 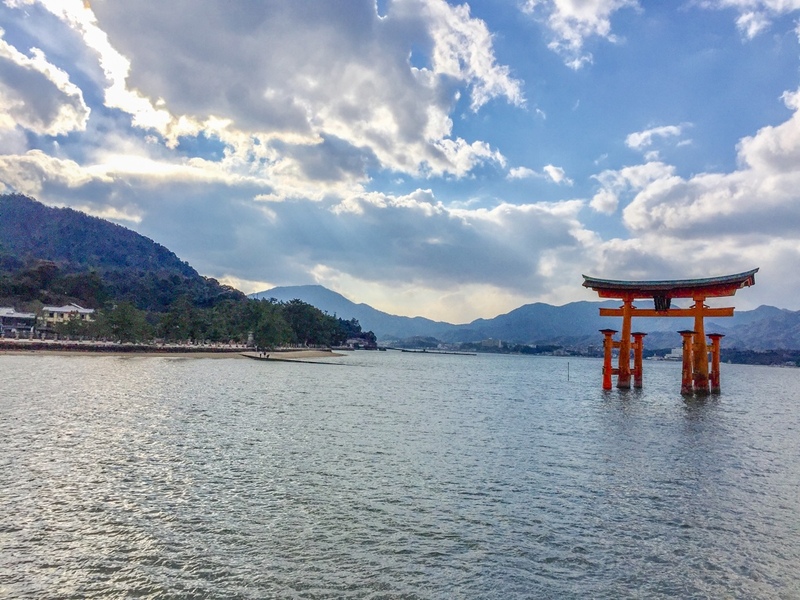 A 30-minute boat ride away from Hiroshima is Miyajima, a tiny island with some ancient temples. Just off the coast is the famous Floating Torii (or the Grand Torii Gate), which is partially submerged at high tide. This is definitely one of the most scenic spots in the country so you can’t miss this on your Japan travel itinerary! You can take a day trip here, or spend the night. Also note that there are many free deer that roam around the area so be careful of any food you carry – a deer actually ate one of my luggage tags! 6. Eat ramen. Lots of ramen. Japan is a food-lover’s heaven. It has the freshest and most flavorful food everywhere at very reasonable prices. Eating ramen is a quintessential Japan travel experience (obviously). Two spots to hit up are Ippudo and Gogyo. Ippudo’s flagship location is in Tokyo. Try the spicy ramen here. Gogyo has locations in Tokyo and Kyoto, and is famous for its burnt miso ramen – a flavor that isn’t available in many places. Both these places have vegetarian-friendly options as well. Note: Ippudo has two locations in Manhattan too! Read up all about vegetarian food in New York. Golden Gai street is a small alley with tons of bars, near the Shinjuku area in Tokyo. Definitely visit this area and hop from one bar to the other – they have the best sake and whiskey. Each bar only has seats for 6-8 people so make sure to go in small groups. If you want to try some cocktail bars or speakeasy’s, head to Ginza. Two options in this area are Bar Evans and Mori Bar. If you are looking for a great rooftop bar, head to the Andaz rooftop. Note that the bars on Golden Gai street are more reasonably priced, while the bars in Ginza are pricier. If you are looking for local souvenirs, visit Asakasu, Harajaku, or Akihabara districts in Tokyo, each of which has a different character. Asakasu has the famous Sensoji temple (Tokyo’s oldest temple) and there are many traditional small shops around. You can buy souvenirs such as decorated chopsticks anywhere. There are also many great eateries in the area. Harajaku has many eccentric fashion shops and is a fun district to walk around. If you are in the area, make sure to visit the closeby Shibuya crossing, the world’s busiest intersection. As many as 2,500 people cross the street every time the light changes. Finally, you could also visit the Akihabara shopping district which is inspired by the game and anime world. In any of the three areas, make sure to find a department store and try the different Kit-Kat flavors – the famous ones are green tea and sake, but the more eccentric ones include strawberry shortcake and wasabi. The Robot Restaurant is a pretty unique experience. It’s located near the Shinjuku area of Tokyo and has 2-3 shows per day in the evenings. The show consists of giant robots (monster-esque), dancers, lasers and lights, and amusing music. It’s plain ridiculous and for most of the show, you’re going to sit there thinking “What am I watching?” The entire show lasts 1-1.5 hours. There is also an option to eat dinner, but I recommend avoiding the food – you can get tickets that include a drink for ~$55. We began one of our mornings with a traditional tea ceremony hosted in a small tea-house in Kyoto. You can’t visit Japan and not experience a tea ceremony so make sure to include this on your Japan travel itinerary. This consisted of a ceremonial preparation and presentation of powdered green tea (or Maccha). There are several such tea houses throughout the city, but we went to one in the Hanazono area, which cost ~$25. The entire ceremony lasts about ~1-1.5 hour, during which the host explains the history and significance of tea. The tea ceremony is elaborate and amazing, and you shouldn’t miss it! There are two big international airports in each Tokyo and Osaka. In Tokyo, there’s Narita International Airport (NRT) and Haneda Airport (HND). In Osaka, there’s Osaka International Airport (ITM) and Kansai International Airport (KIX). We flew to NRT and took a train from there into the center of Tokyo. It’s very convenient and cost ~$35 for a round trip. We did 3 days in Kyoto, 1 day in Hiroshima/Miyajima, and 4 days in Tokyo. Another city you could add to this itinerary is Osaka, which is known for its modern architecture and food. However, we didn’t have enough time for this. Getting around Japan is very convenient. Even though cities are far, you can quickly get from one place to the other. Kyoto isn’t home to a large airport, so we took the bullet train (Shinkansen) there from Tokyo, which was about 2 hours long and cost ~$120. You can buy tickets for these trains at the station because they are very frequent. In Kyoto, we stayed at the Westin Kyoto which was very conveniently located to some of the main tourist destinations. From Kyoto to Hiroshima, the bullet train is ~2.5 hours long and costs ~$100. We stayed at the Miyajima Arimoto Grand Hotel which had a very traditional touch. From Hiroshima to Tokya, the bullet train is ~4 hours long and costs ~$180. In Tokyo, we stayed at the New Otani Hotel closest to the Ginza area. It was a great hotel and it was easy to get to places from here. If you are looking to stay in a more buzzing area, I recommend anywhere in Shinjuku.